The Friday after Christmas Inspector Climate, Mr. Climate and Mrs. Climate (my in laws), and I took a day trip to Daylesford. I didn't really know anything about Daylesford except what I'd read or seen on other people's blogs. So I was going basically just for the ride (and we gave Mr and Mrs Climate massages in Daylesford for Christmas). Our first stop was Trentham. Every town is known for something and my impression of Trentham is that it is known for animal statues. They were every where. For example a cafe had its own vehicle and on that vehicle was a wombat. We stopped at a cafe (the only one that was open in Trentham at the time) and Inspector Climate got some Kefir (which I always associated with milk-y yogurt-y like substance but was actually a fizzy soda) which came in this bottle. I love the ingredients. We also stopped by the Trentham falls which were kind surprisingly pretty. Rainbows! While we waited for the Climates to have their massages Inspector Climate and I wandered down to the Lake in Daylesford. We sat on a little dock and watched the ducks. I've recently become smitten with door ways and doors. I'm hoping it's an affliction that will pass shortly. 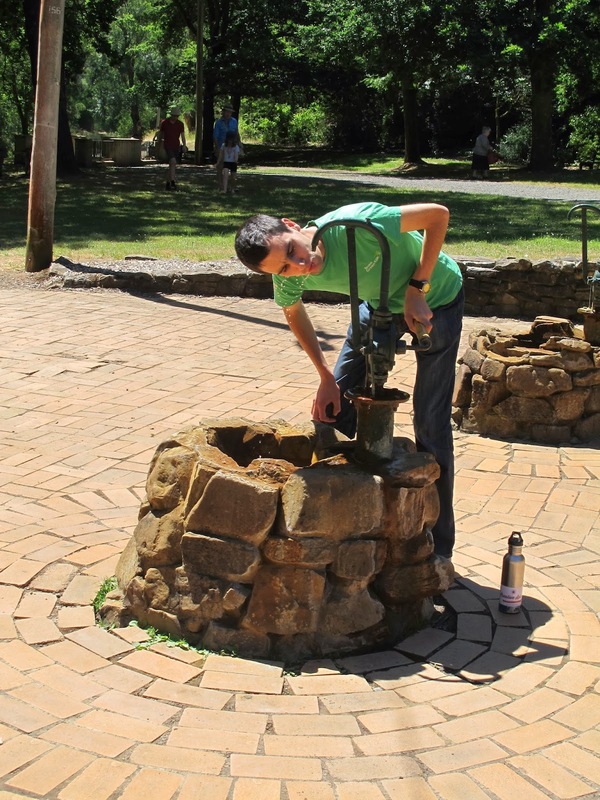 Daylesford is/was known for its mineral water and here is Inspector Climate tasting it. The Breakfast and Beer. 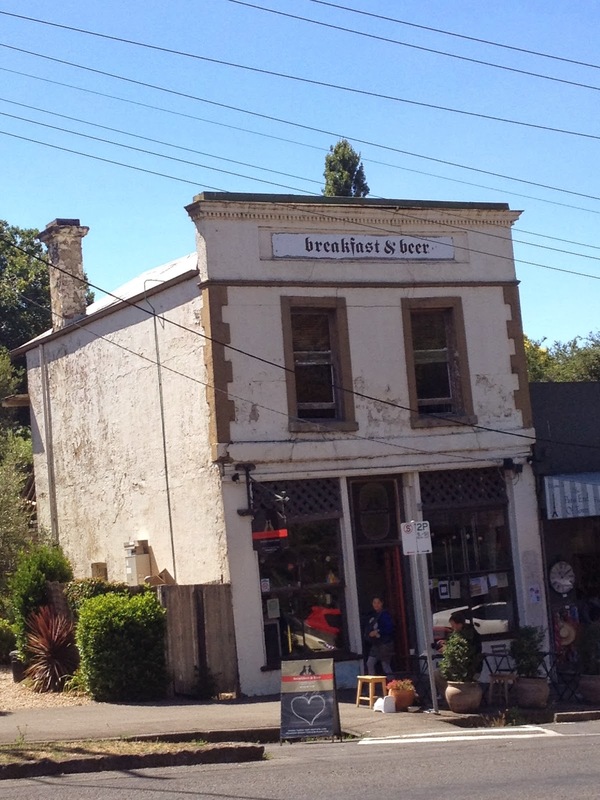 I just loved this little building on the main street of Daylesford. On our way home we stopped at the Chocolate Mill which claims to have the best hot chocolate in Victoria. With a claim like that, we knew we'd be ordering a cup bowl of it. It doesn't look particularly spectacular. But essentially they ladled a scoop full of melted chocolate into the bowl and covered it with milk. It was delicious. 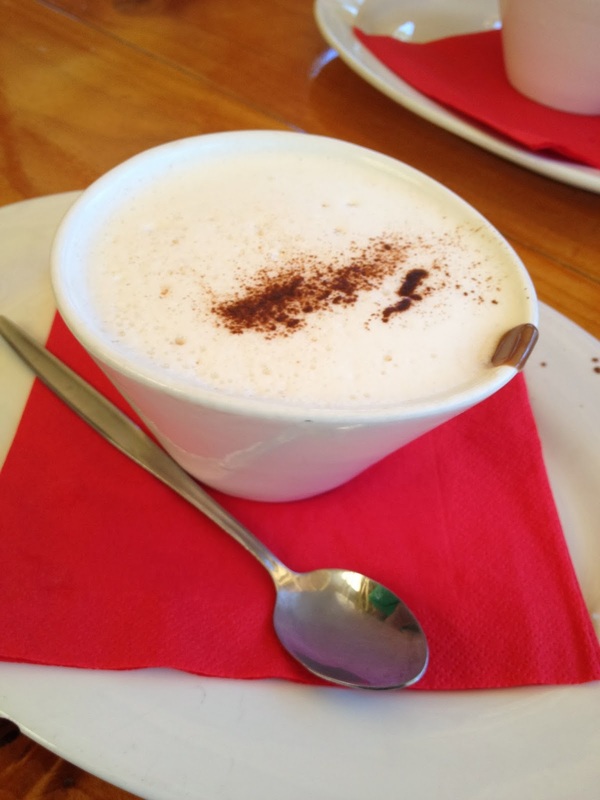 But I haven't tasted EVERY hot chocolate in Victoria to uphold the claim (challenge accepted!). 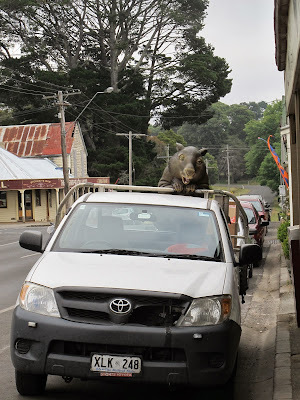 I really liked Daylesford and would love to explore it more. Especially the farm stands (although from asking people most of them are actually wineries which interests me less). It was a great day trip from Melbourne. Mmm . . . hot chocolate. And I love that that beverage 'may contain traces of love' . . . so it must be extra tasty! Needless to say, looks like a great trip! Daylesford looks amazing. I would so love to see Trentham Falls!! I love the animal statues! Super funny. And the waterfall is gorgeous. This looks like such a fun little trip, I'm glad you all enjoyed yourselves! I would LOVE to explore this place! It looks like fun! 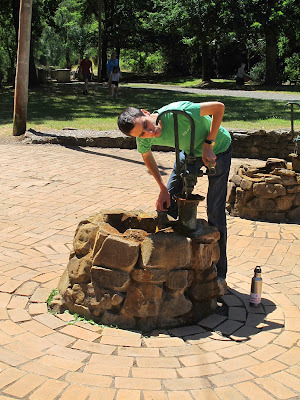 I have never been to Daylesford but have heard so many good things - I would love to go some day. I adore waterfalls too so would definitely love to see the ones at Trentham falls. Looks like a good place to go explore! Lovely! It looks a bit like the Texas hill country. With better hot chocolate! That fall looks so pretty! It looks and sounds like an awesome time!